New to yoga, or looking to get back to basics? This class provides both beginners and seasoned practitioners a place to focus on common postures, transitions, breath work, alignment, and modifications. This class is offered as needed. A fun mix of vinyasa and alignment. This class is designed to develop focus, strength, stamina, and flexibility. This class is open to all levels of practice and ability. This is a heated class to allow for deeper stretching and mobility. A fun mix of vinyasa and alignment. This class is designed to develop focus, strength, stamina, and flexibility. This class is open to all levels of practice and ability. The temperature of the room is set to assist in stretching but comfortable enough for those who do not enjoy a heated practice. A powerful, energetic class, where students will fluidly move from one pose to another. Students should be familiar with Sun Salutations A and B and have some previous yoga experience. The room is intensely heated which makes it a revitalizing and vigorous form of yoga. Come prepared to sweat! Evolution Shred is a cross-training combination of yoga and HIIT (high intensity interval training) based on the Yoga Shred program created by Sadie Nardini. This non-heated class will include short intervals of intense cardio and strength building moves alternating with intervals of yoga postures to stretch, lengthen and recover. A complete cardio, strength and flexibility workout for your mind and body. This class incorporates elements of a vinyasa flow with an emphasis on body sculpting and resistance training by using small handle held weights, sand bags and body weight. You will leave feeling stronger, more flexible and rejuvenated. The room is lightly heated to assist in stretching but comfortable enough for those who do not enjoy a full heat practice. This class combines yoga poses (both independent and with caregiver), songs, games, and creative movement, all centered around a theme to inspire creativity, as well as promote physical and social-emotional development. Babies and children up to 5 years old with a partner. This class will improve you childs strength, flexibility, and coordination. They will learn self-respect and respect for others with the practice of fun and challenging poses, partner and group poses, games as well as centering breathing techniques to improve focus. Ages 6-12 exceptions made with consent from Love Evolution staff. This lightly heated class focuses on improving concentration, increasing body awareness, and boosting self-esteem. This is the class your mom takes but with the music you like and your friends by your side. Ages 12+. Begin to untangle the mind and body with this restorative yoga practice designed to relax the nervous system and let go of muscular stress. Participants will be guided through a few gentle movements to open the body, followed by restorative postures using blankets, blocks, straps, and bolsters. Use this time to relax and practice mindfulness meditation. 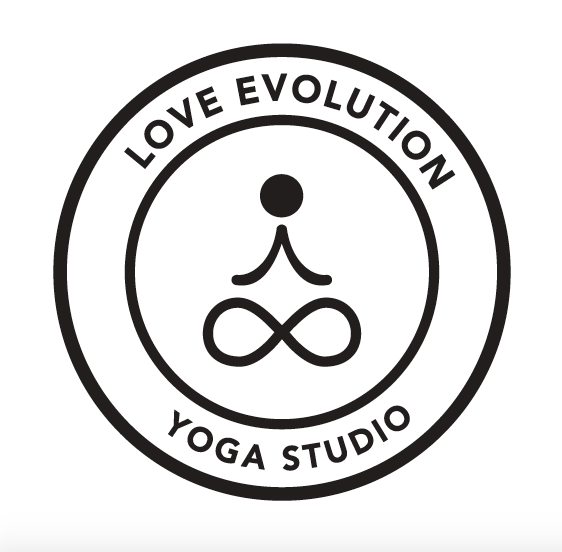 Nourish the body, mind, and soul with this LOVE Evolution class. Suitable for all levels, this class uses basic yoga postures and breathing techniques designed to reverse long held patterns of stress and balance the nervous system. Whether beginner or advanced this class will leave you with a calm mind, a body at ease and on your way to inner peace. This is a non-heated class and pairs perfectly with Evolution Meditation. Calm your mind and turn your attention inward toward genuine self-love and deep inner peace. Using a wide variety of guided meditation techniques, this dialogue-driven class will help you cultivate mindfulness and improve your mental and emotional health. Yoga Nidra is often called “meditation made easy”. This sleep-based meditation technique is an ancient method of deep relaxation. Yoga Nidra takes you just between the waking and sleeping states, where you effortlessly disengage from stress-producing thoughts, allowing your mind and body to naturally and deeply heal itself. Feel free to bring your own blanket and pillow!